Sean O’Donnell, PHR is one of at least 58 people who have endorsed your work. In this case, as Paid Expert Ancestry Genealogist, Researcher at Ancestry.com. 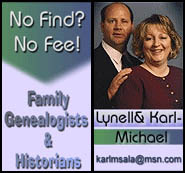 Karl & Lynell Sala were THE very 1st two persons hand-picked for the Ancestry.com Paid Expert Ancestry.com Research Line (PEARL). Why? How about an 80+% success ratio in having found what their subscribers had not been able to find over the last 3 decades! What an app! Good News & a European or German Genealogy Research Tip from a Professional German Genealogist! Lynell Rae Pierce Sala singlehandedly cracks her 2nd German Genealogy research case! GermanGenealogist.com is proud to be experiencing more German Genealogy research cases accompanied by success than any previous year!